The planet-hunting Kepler telescope has spotted the first ever supernova shockwave. It’s a huge first for astronomers: scientists using the Kepler Space Telescope have spotted a massive shockwave from a supernova explosion, and they’ve created an animation that depicts just what it looks like. Researchers were able to spot the huge star explosion that first came into view of Kepler back in 2011. The star, KSN 2011d, is 500 times the diameter of the sun and is about 1.2 billion light-years away, according to a University of Notre Dame statement. Scientists were able to spot the shock wave for about 20 minutes, a huge achievement for astronomers to catch such a rare happening. It could help scientists better understand stellar explosions. 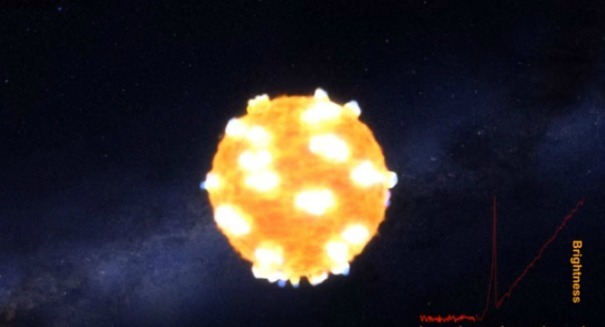 To depict what this kind of shockwave looks like, NASA created a video animation that you see below of the “shock breakout.” It shows a red supergiant star that is 500 times bigger and 20,000 times brighter than our sun. The star implodes when it can no longer sustain the necessary nuclear fusion, leading to a massive collapse and an explosion causing a shockwave as it turns into a spectacular supernova. “The flash from a breakout should last about an hour, so you have to be very lucky or continuously stare at millions of stars just to catch one flash,” Peter Garnavich, professor of astrophysics at the University of Notre Dame, said in the statement.